A chaotic, yet fun musical eye hazard. Written by Gregory Allen III on October 10th, 2018. 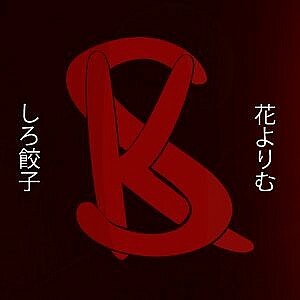 There are many beat-based games available today, from the classic but still fully supported osu! to the extremely new and popular virtual reality game Beat Saber. Both previously said games fail at one thing: automatically creating a level or difficulty solely based on the song itself. Beat Hazard 2 does just that without any human input. Beat Hazard 2 is also unique in the sense that it does not necessarily have you play the level to the beat, but instead creates the level from the beat. However, Beat Hazard 2 is a true hazard for some individuals. If you suffer from photosensitive epilepsy, I strongly caution you when viewing this game as it utilizes bright, rapid flashing lights and colors. As previously stated, this game is based on a song’s beat. With that, there are many ways to give the game songs to use. You can use locally stored audio files on your PC, stream from an internet radio, or use Beat Hazard 2‘s newest feature, Open Mic. Since a majority of people no longer store their own music, Open Mic allows players to use any audio that is currently running on their PC. When enabled, the game will start listening for audio on your PC, meaning that you can use music from virtually any source. Apple Music, iTunes, Spotify and even YouTube are just a few examples that I’ve tested. Beat Hazard 2 then uses the audio to create a level, which varies from throwing different sized meteors at you to giant spaceships with several different types of weapons. In addition, the game uses a service very similar to Shazam called ACRCloud to identify the song that is currently playing. There were some songs that I played that weren’t able to be identified and were simply listed as “Unidentified track”. One example of a song that ACRCloud couldn’t list was Blue Zenith by XI. Firing micro missiles at a boss. Gameplay is fairly straightforward once you have a song playing. 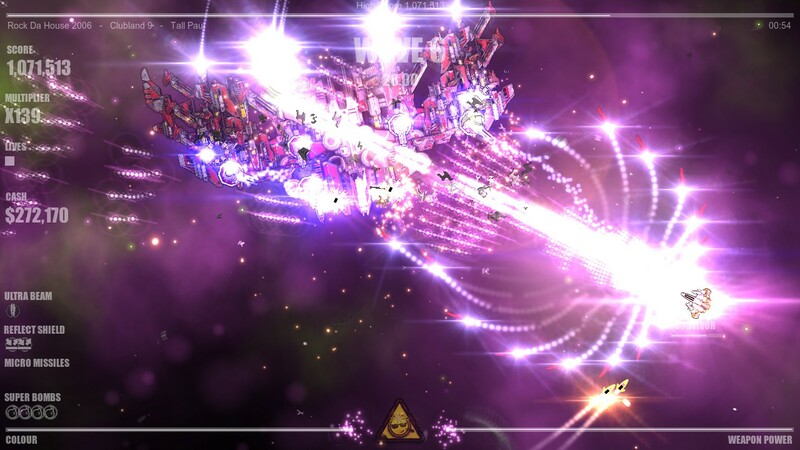 You have one small ship that will shoot lasers based on the beat. This makes specific parts of songs difficult because if the song slows down, so does your firing, in turn causing a DPS decrease. Though small, it does make a difference in your gameplay. The game features different power-ups as well, the two main ones being Color and Power. Color does exactly what you’d think, giving the space behind you and your lasers color. Other than the visual effect from it, I have not noticed any gameplay changes from this power-up. Power’s effects are also in its name and adds firepower to your primary lasers, making them fire a little more often with larger shots. An additional power-up you start with is a single bomb. It detonates from the position of the player, then moves outward from that position like a wave, destroying anything it touches. As the player goes through songs, they also earn money to be spent on perks. Perks are upgradable abilities that can be equipped to give you an edge. They range from one extreme to the next. Some are able to increase the amount of points you gain in a song by increasing the score multiplier at the beginning, providing multiplier power-ups more often throughout, or just increasing the raw point value of destroying certain things. Perks can also be used to increase your firepower by raw value or unlock additional power-ups that can be executed by hotkey. One such upgrade is a shield that will block anything from damaging you for a short amount of time and depending on the object, reflect it to the nearest enemy. Another upgrade, and one of my personal favorites, is the micro missiles. They are small autonomous missiles that seek out the biggest threat on the field. 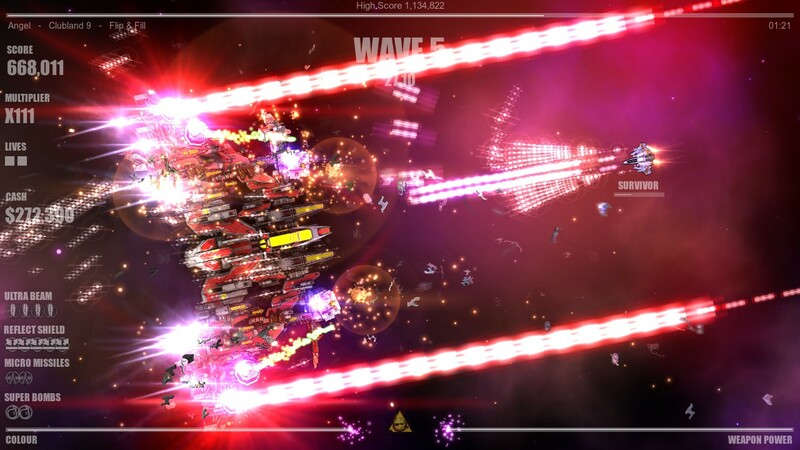 Once further upgraded, you are able to fire off many of them in a volley. 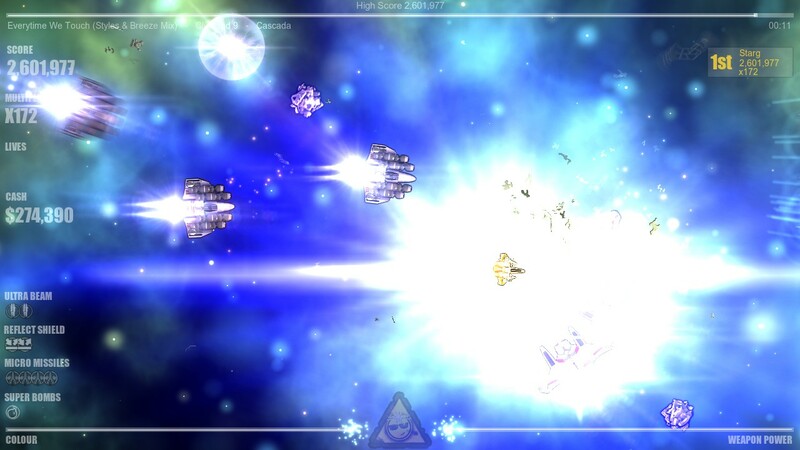 The player maneuvering in space while being blinded from bright, blue light. I did not have many issues with Beat Hazard 2 at all. Although, the lack of an inclusive gameplay tutorial did bother me a lot when I first booted the game up. While some features of the game are simple to learn like the currency and perk systems, gameplay itself is thrust upon the player. There is, however, a short and small tutorial showing you how to navigate the menus. There are no initial pop-ups showing what the controls are, so you’re forced to learn them while you play your first song or two. You are able to change your controls in the settings menu but that is not mentioned in the menu tutorial. There is also little information on the power-ups. As said before, the Color power-up gives the level you are currently playing some color, but I’m unable to tell if that’s all it does. To my lack of knowledge on it, it could be affecting my score if I don’t have the color bar maxed out at all times. Beat Hazard 2 is a very chaotic game that draws its material from the player using their own music, making gameplay very easy to relate to and fun for everyone who can handle its constant graphical changes. There is still some room for improvements in future updates but what it currently delivers is well-worth it. Graphics: Uses bright light and rapidly changing color to add nice flare and difficulty to the game. However it tends to cause a headache over time. Controls: Controls are quick to learn but their lack of explanation made the first few minutes of the game a little bit of a pain. Fun Factor: A very chaotic experience that changes with every song that you play. Replay Value: As the game creates levels based on the song that is playing, you have levels to play as long as you have music to listen to. Originality: There are many games that are beat-based but very few that create such a difficult experience with the use of lights and color. Final Rating: 8.5/10. Beat Hazard 2 is a very chaotic game that draws its material from the player using their own music, making gameplay very easy to relate to and fun for everyone who can handle its constant graphical changes. There is still some room for improvements in future updates but what it currently delivers is well-worth it. Beat Hazard 2 is nothing like other beat games. Hello! I'm Greg but online I'm often known as StarkiSama-sama. Right now I'm currently a junior in high school, and I don't have much of an idea of what I want to do with my life yet. My favorite activities would have to be playing video games, watching anime and experimenting with PC hardware. I also create videos on YouTube and live stream on Twitch.